Thermic Fluids Market size will surpass USD 4 billion by 2025; according to a new research report by Global Market Insights, Inc. Dynamic growth in food & beverage sector due to population growth and improving standard of living across the globe will augment the demand for thermic fluids market across the globe. There are several processes that are carried out in the food & beverage industry which require thermal fluids for the cooling, heating and dehumidifying. Dairies, wineries, breweries and other food processing companies use heat transfer mediums during processing where contact of the fluid with food or portable water is possible. Hence requirement of non-toxic fluid arises. USDA had approved the ingredients in food grade fluids by H1 application (thermal fluids with incidental food contact). These fluids comply with requirements mentioned by FDA. This approval is driving the demand for food grade thermic fluids, which are more efficient than water or steam when used for heat transfer medium. Industries that require heat transfer medium have been using water or steam systems traditionally for industrial processing. Steam is typically used as a heat carrier in various industrial operations like drying, curing, pressing, molding, etc. Thermal fluid systems are replacing the traditional steam systems, as they are more efficient in various parameters such as temperature control, maintenance, environmental safety, production quality and quantity. Such superior properties will propel the market demand in various industrial sectors in future. Raw materials used for production of thermal fluids are derived form crude oil. Fluctuation in crude oil prices will also influence the raw material prices. This will act as a restraining factor for market growth over forecast time spell. On the basis of product, silicone & aromatic thermic fluids market shows growth of about 5.8% CAGR from 2018 to 2025. This type of thermal fluids is best suited for completely exposed systems which are not prone to leaking or contamination. These fluids are impressive to oxidation and protect the fluid from degradation. Glycol based thermal fluids are also gaining attention in food & beverage industry as they are low in toxicity ion case of incidental contact with water and food products. In terms of volume, chemical sector will clutch over 10% share of the entire application segment in 2025. In petrochemical complexes, thermal fluids are used to provide heating for distillation towers, crackers and reactors in production of phthalic anhydride, alkyl benzene, terapthalic acid, dimethyl terapthylate and many other downstream products. Rising investments in the chemical sector due to substantial rise in crude oil prices will result in thermic fluids market growth in coming years. 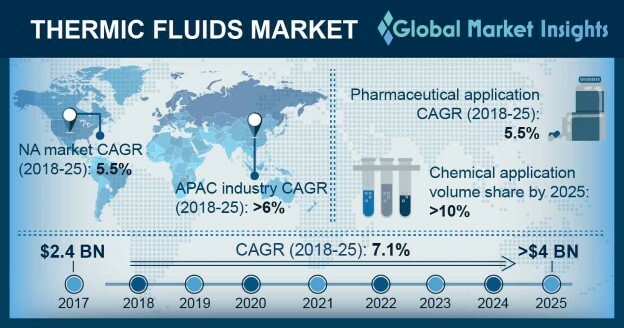 On the basis of region, Asia Pacific thermic fluids market will show decent growth of more than 6% over the forecast years. This is all due to significant presence of industries such as chemical, plastics, food & beverage, pharmaceutical, HVAC, oil & gas in the region. Initiatives taken by governments of emerging economies such as India, China to attract FDI inflow and open more manufacturing facilities will catapult the thermal fluids demand by 2025. Some of key thermic fluids market players are Royal Dutch Shell, Dow Chemical Company, Exxon Mobil, Kost U.S.A. Inc, Dynalene Inc., Multitherm LLC, Hindustan Petroleum, Paratherm Corporation, Tulstar Products Inc., BASF AG, Thermic Fluids Pvt. Ltd., Solutia Inc., Dynalene Inc and others.